Some slightly good news on the Monarch butterfly front: after years of decline, their numbers have improved– up almost 70 percent from last year – says a Texas A&M University researcher. Craig Wilson, a senior research associate in the Center for Mathematics and Science Education and a longtime butterfly enthusiast, says early figures from the Monarch’s breeding ground in Mexico show that it is making somewhat of a comeback from recent disastrous decades and has rebounded from 33 million to an estimated 56.5 million. In 1996-97, there were an estimated 1 billion Monarchs in 15 over-wintering sites in Mexico, and those numbers tumbled to only 33 million in only two sites in 2013-14, the lowest ever recorded.Because more Monarchs actually managed to migrate successfully this past fall, there are believed to be over 50 million Monarchs in nine sites, a slight rebound, Wilson says “The winters the last few years have been rough on them,” Wilson says, “and there is still a lingering drought in and around their breeding grounds. But this has been a fairly mild winter and their numbers are moving in the right direction. “There are still plenty of reasons to be concerned, mainly because the number of milkweed plants – the one plant that is vital to their existence – has been decreasing in the past decade. There are new programs to establish milkweed planting, and the public is urged very much to do so. The Monarch’s survival depends on it. The number of Monarchs once could be counted in the hundreds of millions just 20 years ago, Wilson notes. They breed in Mexico and then have three more generationsas they travel north to Canada, “and Texas is a critical place for them – they have to pass through the state on their way north and lay eggs,” Wilson points out. “So it’s critical for them that they get milkweed here. It is the only type of plant that Monarch caterpillars will digest as the multiple generational migration heads north.”The prevalence of herbicide resistant crops, very dry conditions over much of Texas and numerous wildfires have hampered their 2,000-mile journey to Canada. A recent study from the U.S. Fish and Wildlife Service says that just under 1 billion Monarchs have vanished since 1990. 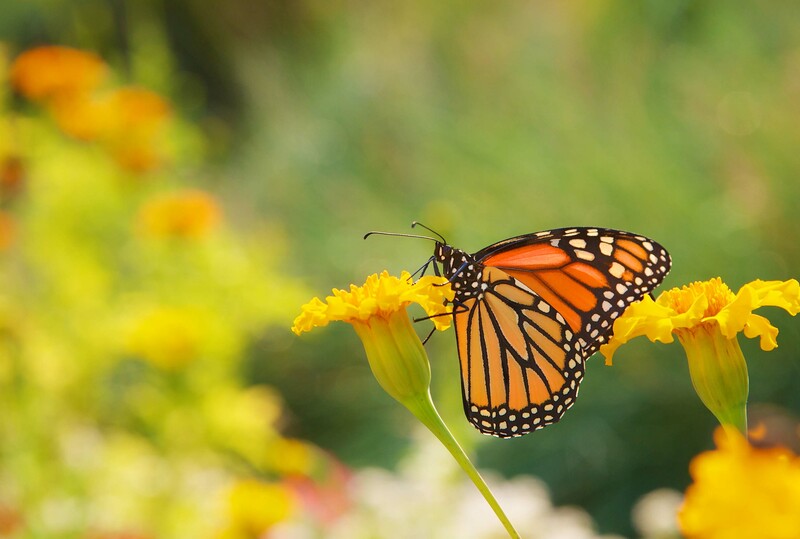 The agency has partnered with two other groups – the National Wildlife Federation and the National Fish and Wildlife Foundation –to plant milkweed along thousands of acres of Interstate Highway 35 from Texas to Minnesota, a route where at least 50 percent of all Monarchs migrate. Wilson is currently adding a variety of milkweed plants to the existing Cynthia Woods Mitchell Garden on the Texas A&M campus. He recommends the following sites for Monarch followers: Journey North, Texas Monarch Watch and Monarch Watch.